Thank you for requesting a Rimmer Bros Catalogue. One Catalogue per customer can be sent free of charge. Multiple catalogue requests will incur a postage charge. Please check the box under the catalogue you would like to receive. If you are placing an order, you can also add a catalogue to your cart (at no charge) by simply typing the catalogue type into the search box - eg - 'TR6 Catalogue' and then add it to your cart. Additional catalogues can also be added to your cart - we only charge for the additional postage. 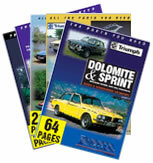 Our catalogues can also be downloaded as PDF's, please click here. Fields in RED are required for your request to be processed. Don't wait click here to download your catalogue now!